SHORT: Agonizingly slow-developing small cell Henryetta-Okemah followed by beefier but disorganized storms same area. LONG: Once we got awake and organized, the Ozarks of SW MO and far NE OK seemed too far (and too unfriendly terrain-wise). Any nearer target for the day was rather nebulous, given the lack of a sharply defined boundary ahead of, and of strong lift along the Oklahoma segment of the dryline. However, we pulled out of Norman to the sight of towering Cu up and down a SW-NE aligned dryline located to our SSE through NE. Despite the SSW winds to its E, high SRH beckoned in eastern OK; and the dryline’s confluence (and convergence) zone became better evident with time during the afternoon in both clear-air mode reflectivity and VIS satellite imagery. As the day before, following close behind (but not too close, since I was consuming pork rinds): the Dude, Three Chicks and a Dog chase team. And yes, given that we were headed to eastern OK, it was fitting that I was wearing a cartoonish “EVERYONE LOVES A REDNECK” shirt DF gave me as a birthday gift. 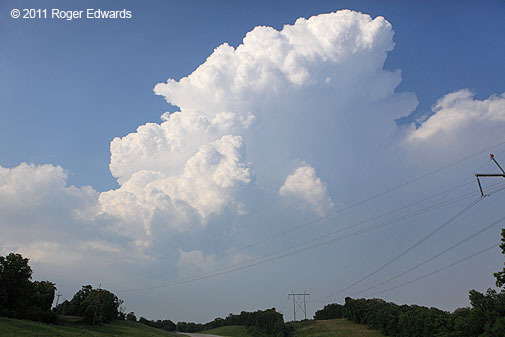 We waited at Ada only a short several minutes before towers erupted into a Cb to our NNE, S of I-40 and E of the dryline. Meanwhile a growing left-mover was charging NE from a splitting process down along the Red River, while the right-mover was dying. With nothing in between, we targeted the cell approaching Henryetta. On composite reflectivity, the storm seemed to level off at under 50 dBZ for well over an hour, despite a healthy (if episodic) chimney of towers shooting forth into its anvil. With MLCAPE up to 6,000 J/kg in its presumptive inflow region, this didn’t resemble the thermonuclear detonation, as have other storm initiations on giant-CAPE days in the same area like 26 May 1997. 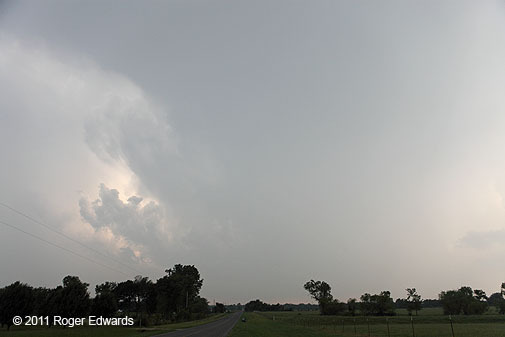 Instead, when we got closer to the storm between Henryetta and Okemah, it sported pulses of small updrafts. As we positioned along US-69, the W edge of the Bigfoot jungle beyond which chasing in OK is just not worthwhile, another storm erupted to the immediate SW of the original cell, to our W, and also near Henryetta. To our N, through haze and intermittent low clouds, we also could see the top 1/2 of the tornado-warned supercell SE of TUL, itself headed into horrendously rugged terrain N and NE of Fort Gibson Reservoir. We let the base of this new storm get closer; but it remained rather flat and featureless, with only shallow, transient and innocuous lowerings. The atmosphere from the new Henryetta storm southwestward past Ada then erupted almost all at once, using up a raft of that giant CAPE air in massively multicellular form. We gave up on the chase day, shot a gap through the big mess, and headed home. Only after arriving back did we learn that a few hours NE of our junky storms, in Joplin, a rain-wrapped EF5 tornado engulfed much of Joplin, causing the worst tornadic death toll in the modern weather-warning era. Clearly the environment was a good deal different from there to where we had been–much of it on the storm scale. Horrible fortune played a part too; the same tornado several miles N or S would have missed town, likely causing few if any casualties. In a year of rotten placement of several cities with respect to the tornadoes that would strike them, this was the worst in terms of human toll.